Finally--the book the cook (and all other family members!) has long awaited. 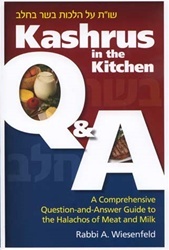 This question-and-answer guide takes the guesswork out of kashrus. With clear, authoritative answers to real-life questions, you'll feel that the author has been listening in on your kitchen when you read this comprehensive book. Can a microwave be kashered? What happens when milk spills into a batch of chicken? How many hours do children need to wait between milk and meat? What happens to dishes of dairy and meat washed in the same sink with hot water? And, of course, can challah baked in a meat oven be eaten with cheese? This book is a must for every kitchen, an answer to every kashrus prayer for the scholar and layman alike. With extensive footnotes and a thorough index.